We worked with artist Alison Milner to use artworks to create a focal point within the waiting area of the Delamere Unit in Runcorn to help distract and alleviate stress, and then to develop the themes and design further as surface pattern design in the space. Runcorn sits on the banks of the Mersey River. Its history and identity lies in its former role as an industrial town and cargo port. Yet, today, industry has declined and much of its industrial landscape has been reclaimed and transformed into nature reserve. The image that greets visitors to this Macmillan Cancer Centre says very clearly that this is Runcorn. The river, the Silver Jubilee Bridge, treasured local plants against an industrial backdrop – all speak of Runcorn. This welcoming image signifies that this cancer centre is is unique, local, and personal to the people of Runcorn. The theme and design of the artwork permeates the rest of the building creating a sense of identity and character for the unit, whilst contributing to the creation of a supportive environment for staff and patients and helping with wayfinding. Furniture was selected to compliment the design of the unit, and bespoke Formica veneers were created for the tables which link to the entrance artwork. 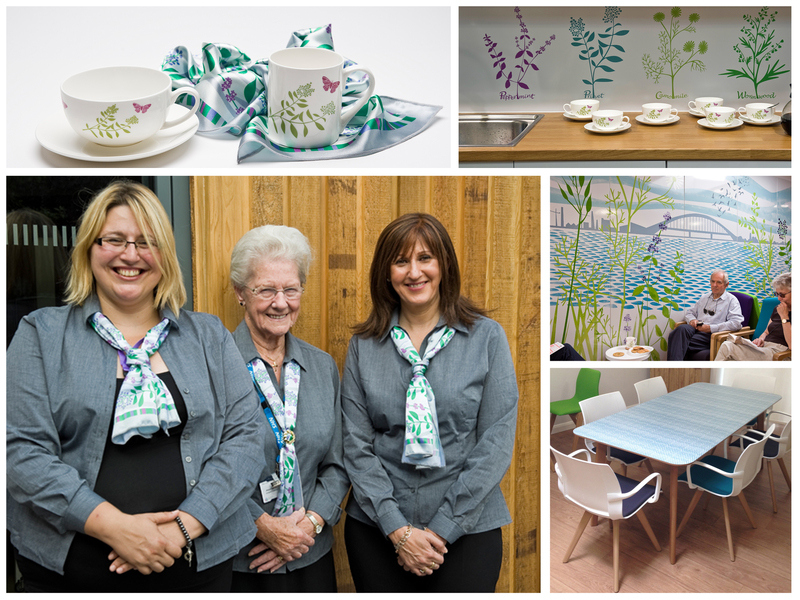 Images of healing plants and herbs from the main entrance artwork were used to create a splash-back in the coffee area, and transfers were made for cups and crockery using the same images. Alison Milner even designed and made silk scarves from the same designs for the staff to wear, emphasising that the role of staff in creating the right first impression, in welcoming and reassuring patients, is just as important as the role that the physical environment plays.